I’ve never been into the creepy or really spooky side of Halloween. I love the candy, the cute costumes, the creativity of the homemade decorations but I do not like the blood and gruesome side. We did a Halloween haunted house tour around the city yesterday – basically like a Christmas light tour but for Halloween – and some displays are so gruesome! Kids seem to love the creepy displays but I’d be fine just to hide my eyes and wait in the car. Ha! Our free printable today – these Glampire treat boxes – are cute without the scary side of Halloween. What is a Glampire? A glam vampire, of course! Sure, vampires can be creepy but a Glampire is all sparkles and glam with just a small touch of spookiness. 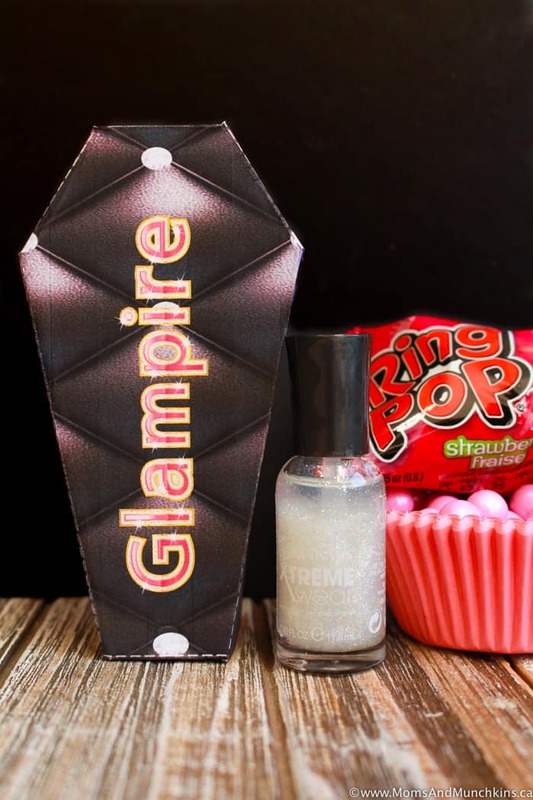 These Glampire treat boxes would be perfect for a Halloween Ghouls Night party! 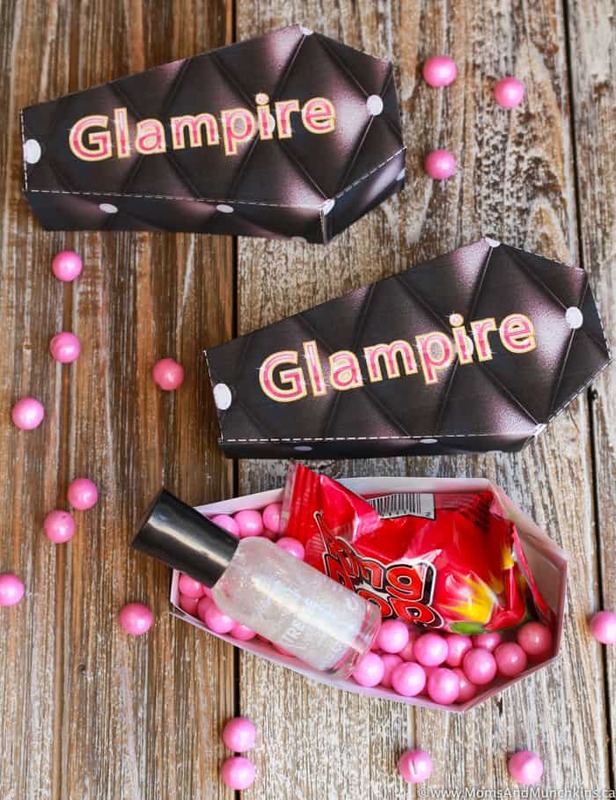 So what do you put inside the Glampire treat box? Anything you want! This is a free printable file that you’ll print on card stock at home, then cut out and put together with tape. Since it’s made of paper and tape, you won’t want to put anything too heavy in them. Some cute treat ideas would be Halloween nail decals, pink candy, candy jewels, plastic vampire fangs with a diamond sticker on one fang (we’re assuming Glampire has a fa-boo-lous dentist! ), nail polish, dark red lipstick, small dark eyeshadow kit, etc. 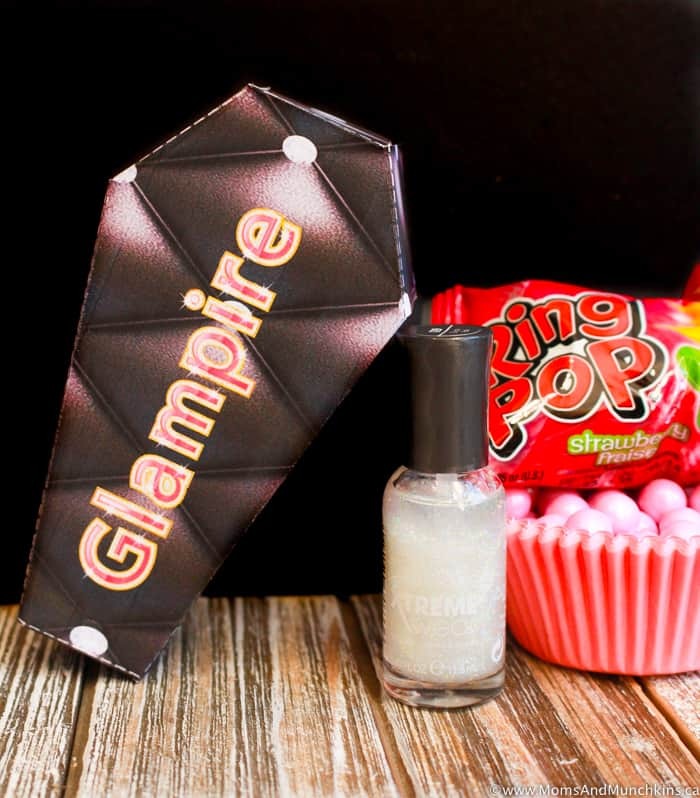 This Glampire treat box printable is available for FREE for our monthly newsletter subscribers! Signing up is free & easy. We have over 17,000 subscribers that enjoy the special freebies each month! Simply enter your email address, confirm your subscription, and you’ll be directed to a Thank You page with a link to the freebies page along with the secret password. This link and password will also be repeated in each of the monthly newsletters. Already registered but can’t remember the password? Send me an email & I’ll help you out! Looking for more cute ideas for Halloween like free printables, treat tags, recipes, party ideas and more? Check out our Halloween page! 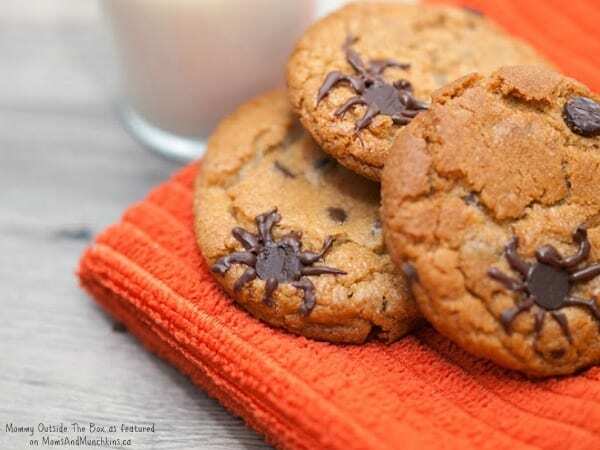 Here’s one of my Halloween favorites – Spider Infested Chocolate Chip Cookies! Stay updated on the latest home entertaining & family fun ideas by following us on Facebook, Twitter, Instagram and Pinterest.